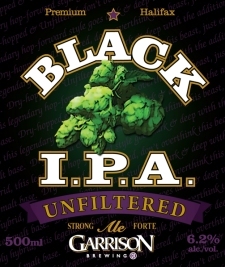 HALIFAX, NS – Garrison Brewing have announced that the newest addition to their line-up of rotating seasonals will be Garrison Black IPA. Inspired by similar beers that have become popular in San Diego and other American craft beer hotbeds, Black IPA will be a blended beer (presumably a combination of their Imperial IPA and Martello Stout, although this has not been confirmed) that has been dry-hopped and conditioned for a further 2 weeks. The resulting brew is 6.2%, and will be bottled and released for sale on January 29th. Garrison will also be bringing back two popular seasonals, Ol’ Fog Burner Barley Wine and Sugar Moon Maple, for another year. Originally released last April, the new batches will be available on February 17th and March 15th respectively. Come on my little redneck NSLC, don’t you dare fail me again and not carry these ones next month. I doubt Black IPA will be sold to the NSLC, or if it does it would be exclusive to a select few.